Huntington Beach – The Los Alamitos boys lacrosse team began the week in third place in the Sunset League behind first place Edison and second place Huntington Beach. They also dropped to no. 16 in the most recent coaches poll. With only three games remaining in the season before Tuesday night, the possibilities for the Griffins range winning Sunset League and the automatic playoff bid that comes with a league championship to possibly not making the playoffs if they fall below no. 16 by season end. Los Alamitos got its first game out of the way, beating Marina 16-9 on Tuesday at Marina High School. The Griffins won despite not having the services of Bronson Ban who, according to Los Alamitos coach Tim Fox, sat out with an injured hamstring. The Griffins improved to 9-7 overall and 4-2 in league (a half game behind Huntington Beach), and can now turn their attention to their next game, where they will face first place Edison on the road on Friday at 6 p.m. Fox is hopeful that Ban will be able to play on Friday, but he is just happy that his team was victorious against Marina. “Since we had already played these guys [Marina], we knew what to expect. They came out fighting, they came out strong, but our guys were ready and I’m proud of them for getting the win,” Fox said. Los Alamitos led 4-2 after the first quarter when Marina came back with two straight goals to make it 4-4 at the 5:26 mark of the second quarter. But the Griffins regained the lead and never looked back, as they scored three straight goals to take a 7-4 lead at halftime and win the game from there. Ethan Campos had four goals, while Cash Lopez and Trenton Jones had three goals apiece. Jones chipped in three assists while Lopez added one assist. “It was great to see Cash step up as a senior and get his looks. Our team sharing the ball today is probably what helped us really get the win,” Fox said. 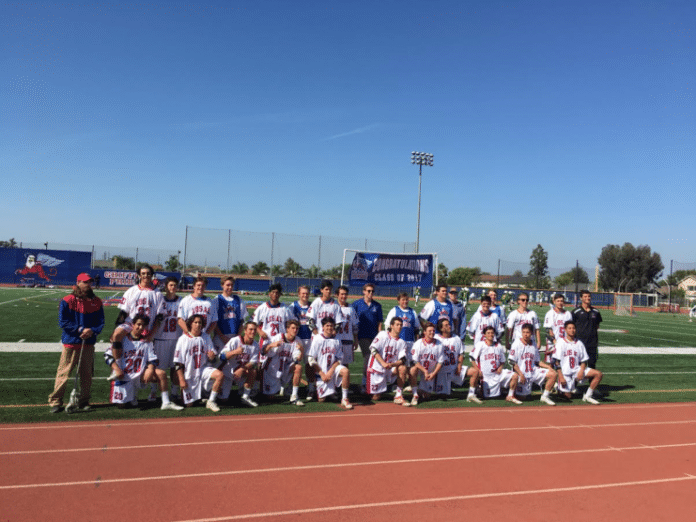 Adrian Rojes had two goals for Los Alamitos while Hunter George, Julian Loe, James Sparks and Matt Fanelli each had one goal. Fanelli chipped in two assists while goalie Cullen Murray had 12 saves. For Marina, Brian Routley had three goals, while Ben Tracy, Scott Lux, Kevin VanNattan, Chris Hererra, Matt Halvorson and Brandon Villescas had one goal apiece. Aidan Stirbu dished out three assists while goalie Noland Andersen had 13 saves for the Vikings (5-9, 0-6). “He [Routley] is just one of the players that has come out, he’s put the ball on the ground, he’s pulled the trigger when we’ve asked him to pull the trigger and he’s changed his attitude in practice on and off the field. He’s just one of those players that’s just been an all-around kind of guy in changing and really buying into the program,” Marina coach Nick Dallas said of Routley. With two league games remaining, the Vikings, which won three league games last year, look to avoid going winless in league play. “What it’s going to take is just, washing out all the negativity out of our mind and just focusing at the game at hand, not worrying about what happened last week or the week before that. Just really taking the game one quarter at a time, trusting in our teammates and just playing hard,” Dallas said. Marina’s next game is Saturday at Corona Del Mar at noon.